Late summer 116 AD. Across the deserts and ancient cities of Mesopotamia Trajan’s grand war of conquest against Parthia rages on with no end in sight. Rome stands at the highwater mark of imperial expansion. Its borders stretching from the scorching heat of the Persian Gulf to the freezing forests and wastes of the Caledonian frontier. Fergus is now second in command of the Fourth Legion. Assigned to garrison the great metropolis of Seleucia on the Tigris, he and his small command are soon caught up in the thick of a major uprising against Roman rule. A rebellion that will stretch Roman resources and determination to breaking point and determine the limits of empire. Meanwhile back on the island of Vectis off the southern coast of Britannia, Marcus, Fergus’s father, has become a fugitive. Run out of Rome and stripped of his position by powerful senatorial enemies who want his head, Marcus returns home, knowing that he and his family stand on the brink of complete disaster. Stubbornly refusing to abandon his farm, Marcus resolves to find a way in which to stave off his powerful enemies and ensure his family’s survival. But the odds are heavily stacked against him. Having read all nine of the books in this series. I feel that Kelso has done a magnificent job of educating me in just how large and sofisticated the Roman empire really was! These nine books in the series are also entertaining on thier own! I enjoyed each and every one!! I got hooked with the first book and kept re reading as a each new one came along. Great Author who paces story well and enough historical detail to feel its really happened. Good value books as well priced for pages contained. 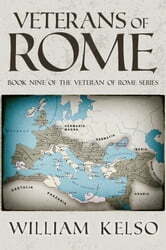 I just finished the nine-book Veteran of Rome Series. I absolutely loved it. This is one of the best authors I have read in the genre of Historical Fiction, and I enjoyed learning the history and geography from a soldier’s point of view. The action is non-stop, with the main characters finding themselves in trouble over and over, and somehow pulling out of it, with brains, hard work and some very good luck. I made a comment in a previous review about evidence for a lack of proof-reading throughout the series. 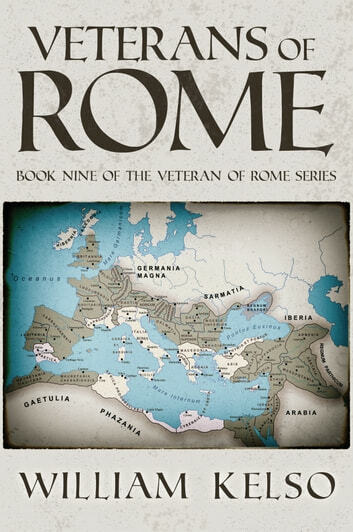 I recommend this series for anyone interested in Ancient Rome, battle scenes and strategies, and a good story.